For Back to School Time: Resources Galore and a "Fairness Checklist"
It’s the beginning of Fall and that always means … Back to School time! Along with the usual supplies like pens, notebooks, Number 2 pencils, and maybe a lunch box with superhero cartoons on it, parents and students might want to consider equipping themselves with other useful tools: the ACLU-WA’s many resources about rights at public school. 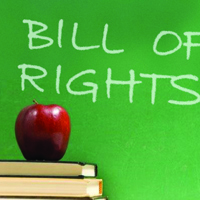 Know Your Rights: A Guide for Public School Students in Washington: Summarizes the current laws governing students' life in Washington's public primary and secondary schools. Parents' Guide to Public School Discipline in Washington: Provides nuts-and-bolts advice for parents whose children are facing disciplinary proceedings at a public school. Parents' Guide to Truancy in Washington: A practical guide on the process of truancy enforcement in Washington schools. Parents' Guide to School Board Advocacy in Washington: Assists parents who want to communicate and advocate before their school board. Gender Equity in Athletics: A Guide for Families and Students: Helps students, parents and guardians understand students’ rights concerning gender equity in athletics in Washington. And another tool is “The Fairness Checklist” compiled by Washington’s Office of the Education Ombudsman (OEO). Schools make many decisions that can have a profound effect on students and parents, particularly decisions involving school discipline. The Checklist does a great job of describing the steps that improve the fairness of these decisions. Take a look and see what you think!